"A blog? Isn't that a weblog without the 'we'?" Althing  isn't a blog . It's a weblog, equipped with additional features that facilitate research, analysis and production  of texts. Althing is not a replacement for 'parler', for exchange of opinions, discussion and interaction, for deliberations between real pupils in real classrooms. This chapter elaborates on other chapters. 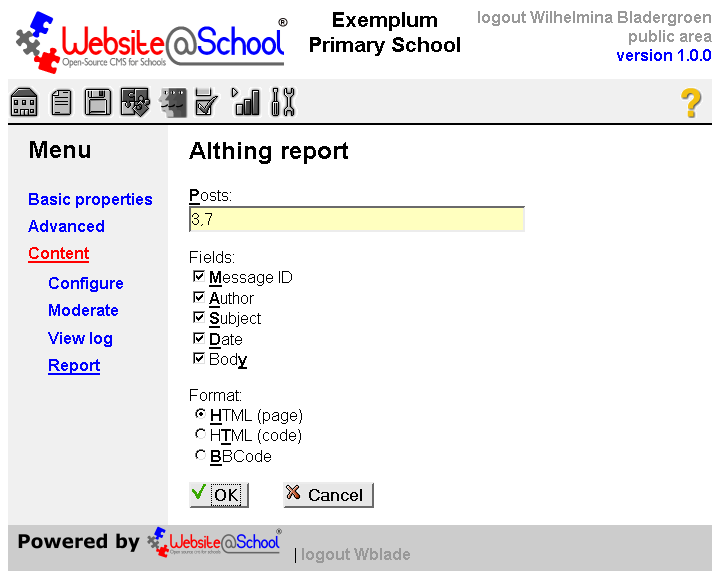 We assume you have at least done Basic procedures for beginners of the Website@School Users' Guide. Blind and visually impared users: Althing can be used and managed with braille terminal and screen reader. Posts: Users can add post, review and edit posts before posting. BBCode and images can be used. Replies: Reply to a post. Harvesting: Reply to selected posts. 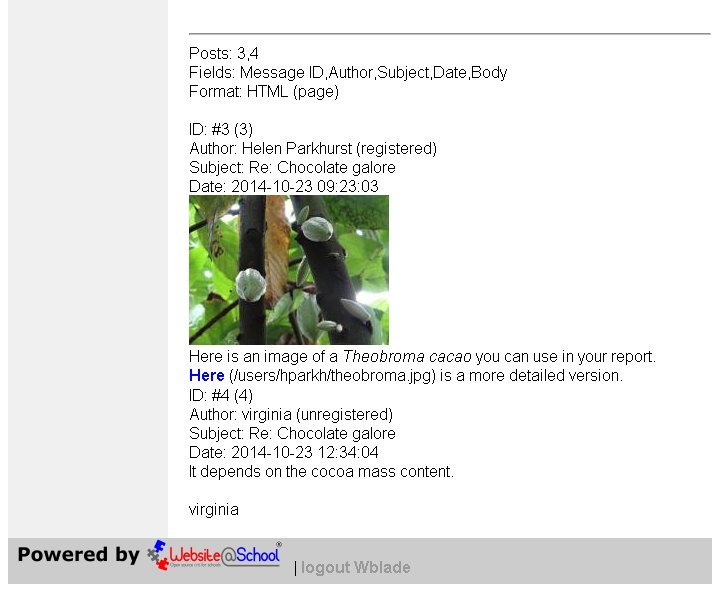 Reports: Selectable posts, fields and report format (HTML, plain text or BBCode). 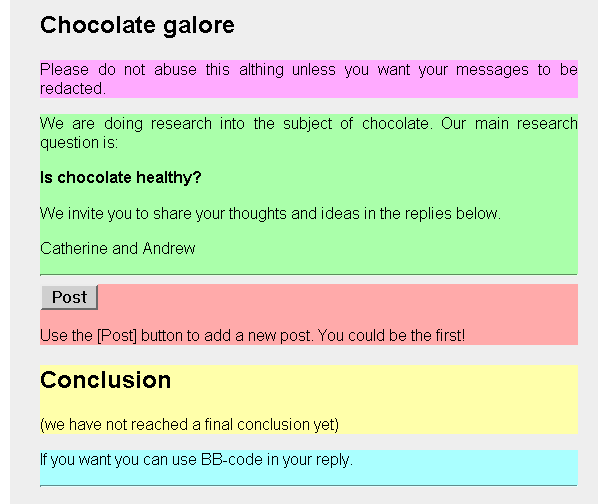 Moderation: Posts can get 'marbles' (qualifications), comments, visible/hidden, published/unpublished. 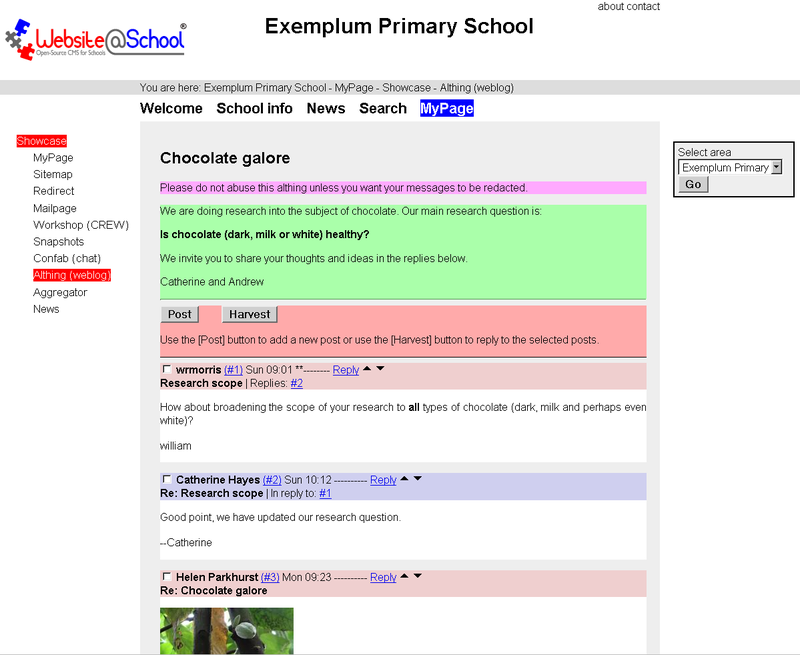 Header, introduction, question, conclusion and footer texts: Text fields, HTML and CSS can be used. E-mails: Moderator and subscribers e-mail notitfications. Bazaar Style Style: very configurable wiht BSS. As example Althing we use a simple question. The posts that follow show features of the Althing module for visitors and posters. Please note a few items. They play a role in the explanation. The question "Is chocolate (dark, milk or white) healthy? 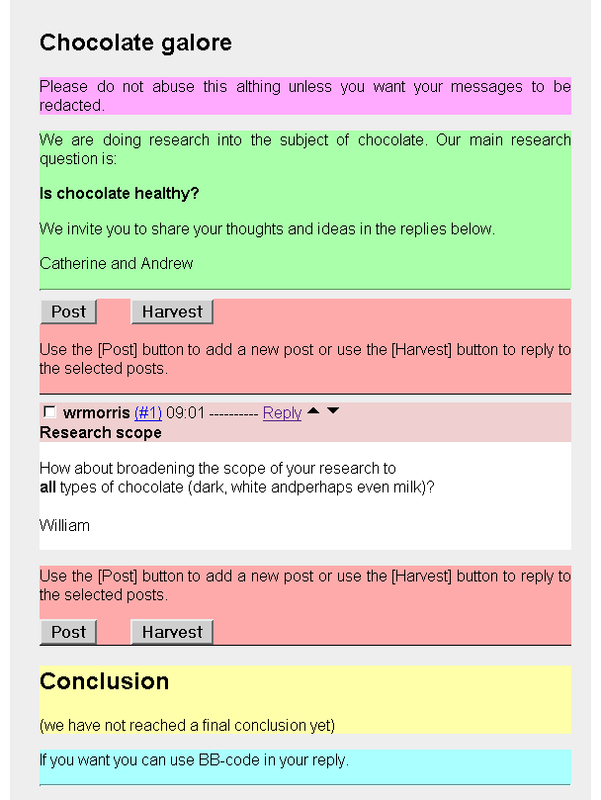 ", the [Post] and [Harvest] buttons and the clickable text links in the pink colored fields. Do not worry about the colors of the header, posts and footer. They can be changed with Bazaar Style Style to fit your theme. If you are impatient, you can create your own Althing from scratch by following the steps below. To get hands-on experience, create a test Althing yourself. For example in the Area of the Exemplum Primary School demonstration data. You've done the Basic procedures for beginners. As usual, add a page. In the Module dropdown menu select Althing (althing), set the page visible, click [Save]. You are immediately in Edit basic properties of page n.
In the Menu, click Configure. You are now in Althing configuration. At 'Status of the althing', if necessary, set the radio button on: Opened. At 'Initial visibility', change the setting of the radio button from 'Hidden' to 'Visible'. In the field 'Moderator e-mail addresses', enter your valid e-mail address. Optional: enter something in the fields: Header, Introduction, Question, Conclusion and Footer. It's unimportant and can be changed later on. Go to your website's Althing page and click [Post]. Add a post, preview it, edit it and submit it by clicking [Done]. Your post is immediately visible. An e-mail alert is sent to your address (step 5). Go to the Page Manager's Alting page, click Moderate, click on the ID number 1. The page Post -1 yourname - date opens. Moderate the post. At 'Marbles' enter a number between 1 and 10 and enter some text in 'Remark'. Click [Done]. To generate a (very small!) report, in Menu, click Report to enter Althing report. In the field 'Posts' enter '1' (omit quotes) and click [OK]. Play with the report checkboxes. Check the View log and check your moderation on your post on the site. Time to add some posts! Here ends the Althing for the impatient. In the next section we discuss the posting process. 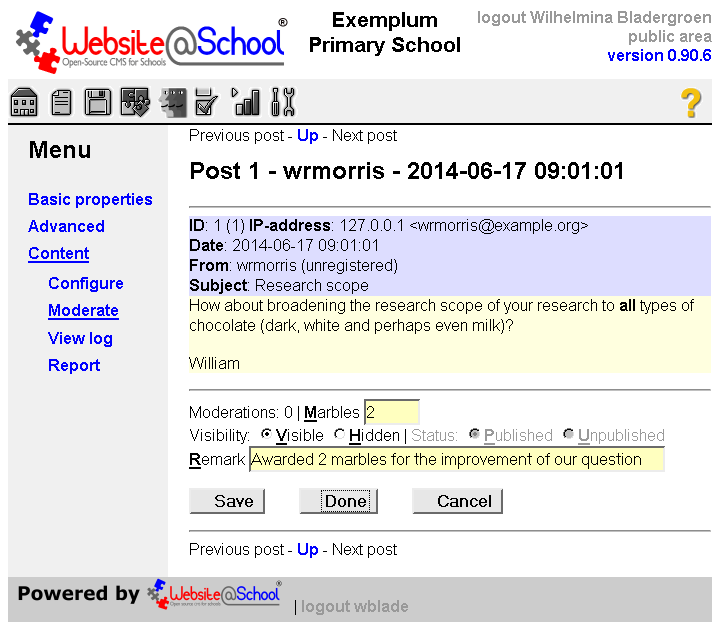 In this section we describe the posting process by the unregistered visitor 'wrmorris', i.e. someone not logged in. The default settings for our demonstration Althing are: 'Status' is 'Open', i.e. posting is possible, and at first, 'Initial visibility' is 'Visible', i.e. posts from unregistered visitors are immediately visible. Details can be found in Configure. 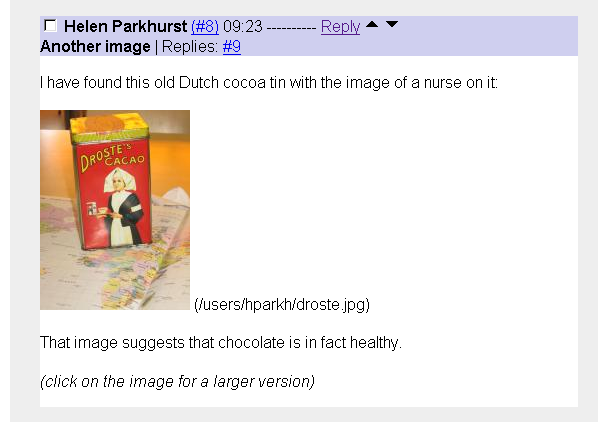 Please read the research question "Is chocolate healty?". Yes, something is missing. Also note there is no [Harvest] button (there's nothing to harvest), and note the text "You can be the first!" (because there are no posts). 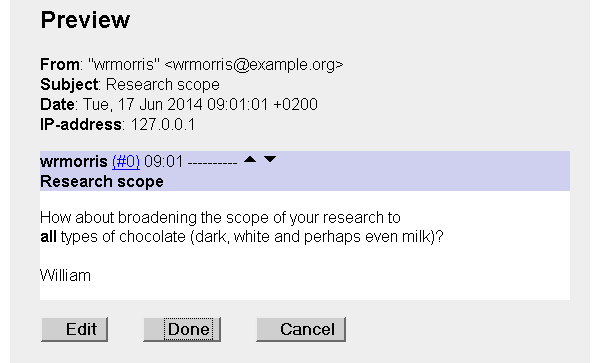 Note that wrmorris created his own subject: Research scope. Name (required): Enter a name. When a logged in user posts, this field contains the full name of the poster. Default text: wrmorris. [Preview]: Clicking the [Preview] button brings you to the Preview dialogue. Not a bad idea. [Cancel]: To cancel the post and return to the Althing overview page. 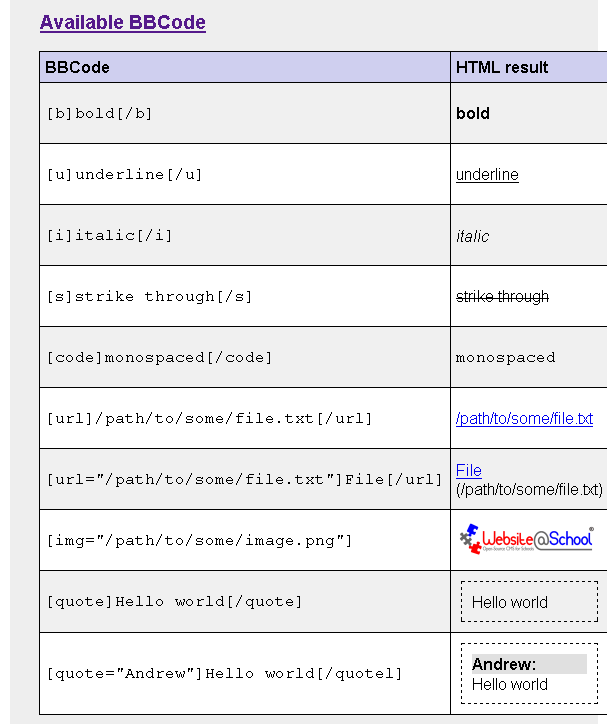 Available BBCode: Below is an overview of the BBCode tags that are available to markup the text. Website@School uses BBCode as a security feature. The examples in the texts and screenshots speak for themselves. BBCode: opening tag at offset 8 (near '[b]error') does not match closing tag at offset 19 (near '[/u ]'). Count the characters in the message and find the error. From: The name and e-mail address entered in the Name and e-mail fields. 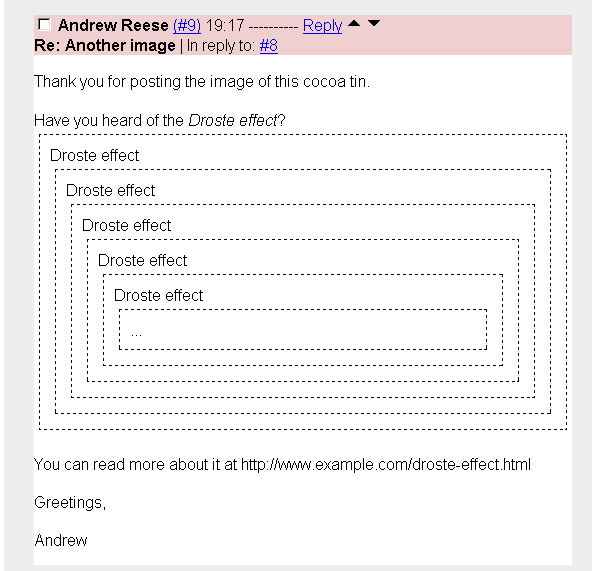 The name is visible in the post, the e-mail address is visible in moderation. Subject: The subject entered in the subject field, visible in post and moderation. IP-address: The posters IP-address. It is invisible in the post and visible in moderation. [Edit]: Brings you back tot the Add a post dialogue for further editing. [Done]: Will post the post, send an e-mail to the moderator(s) and opens the Thank you for your contribution dialogue. [Cancel]: Brings you back to the overview of posts. Click the [Done] button to post the post and send e-mail alert(s). Remember, in Configuration, the Initial visibility in the demonstration data is: Visible. William Morris is a visitor, his post is published immediately. An e-mail alert is sent to the moderators Catherine Hayes and Andrew Reese and (if added) subscribers. You can find an example of an alert e-mail that is sent to the moderators in section 3.2.2 The e-mail alert messages below. Thank you for your contribution: Header tekst. http://exemplum.eu/index.php/38/Althing_(weblog).html#p1: The text speaks for itself. Click here return to the overview page: The text speaks for itself. The remainder of this dialogue is the same as the preview page. There are no buttons. Note that the [Harvest] button is added and texts are changed. Harvesting is explained in 2.4 Harvesting. Catherine Hayes is one of the moderators of this Althing. Catherine is a registered user, i.e. she has a username and password. Her e-mail address is added to the list of moderators in Configuration. Thus she receives the alert message generated by wrmorris' post. Catherine logs in, changes the Question and also awards William's post with two marbles. This is discussed in section 3.3 Moderate. Subsequently she creates post #2 to thank William in public. Note that the Reply link was clicked. The 'Re:' is added to the subject automatically. File Manager (opens in a new window): Clickable link. Catherine is a registered user and is logged in. She has permissions to the File Manager in her 'My Files' directory, so the link is added. This is described in section 2.4 Adding files. Name: Catherine Hayes: Catherine is a registered user and is logged in. When she replies her full name is automatically added. 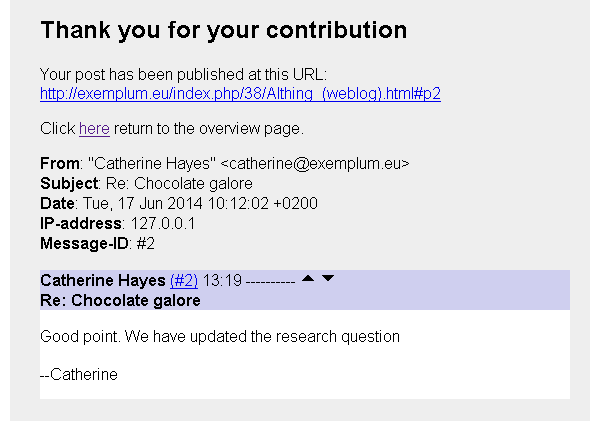 E-mail: catherine@exemplum.eu: The address is automatically added. Subject: Re: Research scope: This post is a reply so the original subject is automatically added. Note that anyones post (either from visitor or from registered user) is visible immediately as long as the 'Initial visibility' is set to 'Visible'. The texts at the buttons are changed. 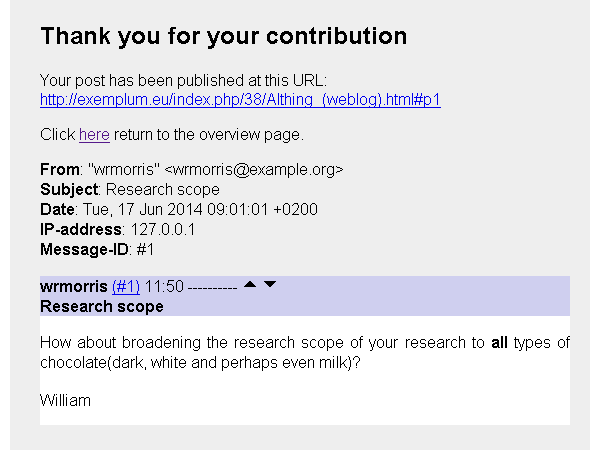 Wrmorris has received a reply, clickable link #2. Clicking on the link brings the post to the top of the page. Catherine is modeator. 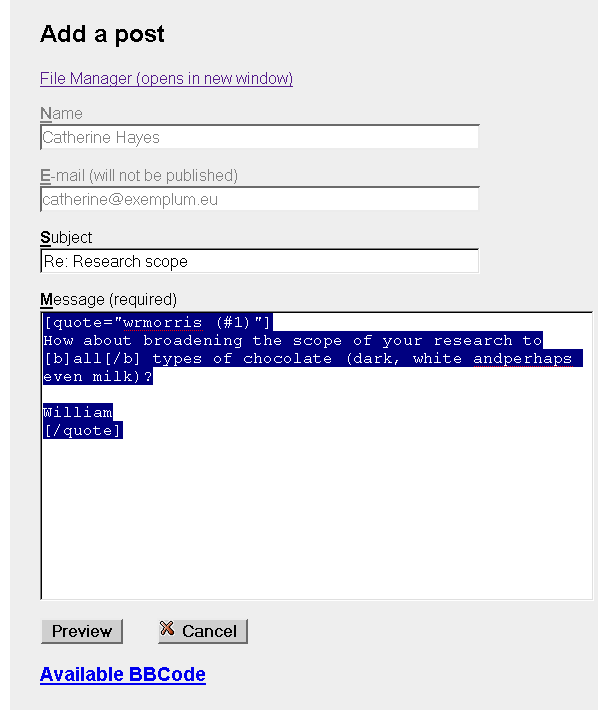 She has followed wrmorris' advice and adapted the research question in the configuration.This procedure is explained in section 3.2.3 Text fields. She has given wrmorris 2 marbles. This procedure is explained in section 3.3.2 Moderate a post.. In reply to: #1: Clickable link to see the original post at the top of the page. Now that there are two posts, the Sort ascending or Sort descending link is added. Photo by Hans Vissers, Botanical Garden, VU University, Amsterdam, the Netherlands. you can use in your report. is a more detailed version. can upload files (images, PDF's, etc.) and can create links to them. Unregistered visitors must enter plain URL's (i.e. non-clickable) to point to materials. This is a security feature. Click [Post] or [Harvest] to Add a post. Your name will be in the 'Name' field because you have an account and are logged in. Put the cursor between the two quotes"". Navigate to the file you want to use. Select the file by clicking on its name. You return to the post. 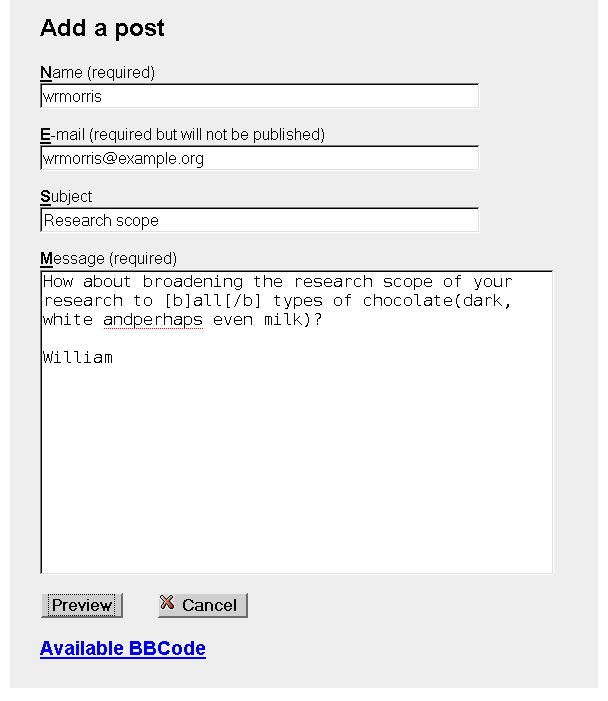 In the Message field the path to the file is entered in the BBCode. Finish your post and check the result by clicking the [Preview] button. Below the remaining posts are explained, each post shows a different feature. NOTE: Almost every item in the above screenshot has a mouseover. Please explore and experiment! Checkbox: Mouseover text: Use [Harvest] to reply to multiple posts simultaneously. 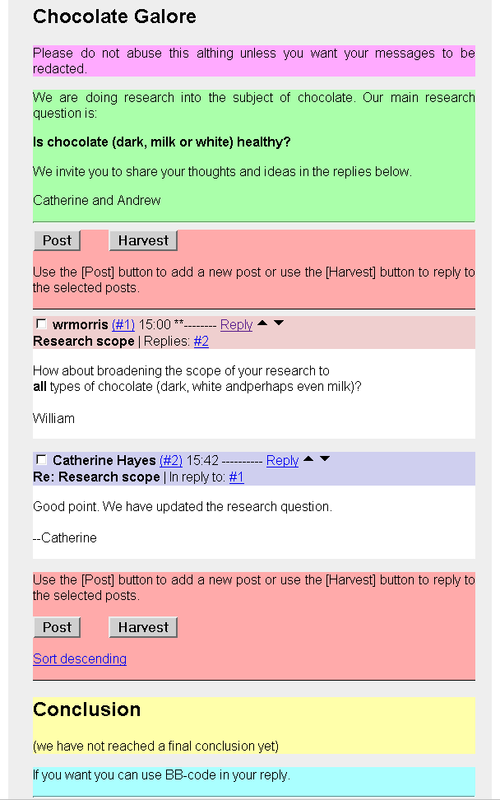 Select multiple posts by ticking their checkboxes and reply to all of them by pressing the [Harvest] button. Andrew Reese: Mouseover: 'registered' or 'unregistered'. Name of the poster. When registered, the full name of the user is shown. (#5) : Mouseover: no mouseover. Every post in this Althing has a unique number. When clicking the Post ID, the post is displayed at the top of the page. hh:mm or Day hh:mm: Mouseover: yyyy-mm-dd hh:mm:ss. ----------: Posts can be rewarded with 'marbles' by the moderator(s). Minimum 0, maximum 10. Mouseover: Marbles rewarded to this post n out of 10. ***-------<//span> means 3 marbles, etc. Reply: Mouseover: Reply to this single post.Clickable link opens the Add a reply dialogue. 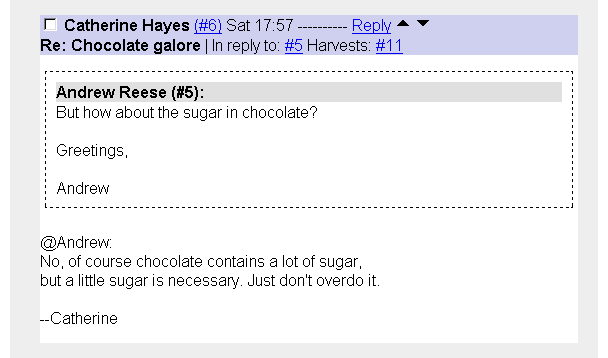 Re: Chocolate galore: Mouseover: no mouseover. The subject of the post. Replies #n: Mouseover: no mouseover. Clicking the link opens the post of the replier in the top of the page. In reply to: #4: Mouseover: no mouseover. This post, #5 is a reply on post #4. Clicking the link opens that post in the top of the page. NOTE: If this message #5 would be a reply to two or more posts, this text would read 'Harvested from: #6, #7' rather than 'In reply to: #4'. Replies#6, #7: Mouseover: no mouseover. This post, #5 has generated two replies, #6 and #7. Clicking #6 or #7 opens the corresponding post in the top of the page. Harvests #11: Mouseover: no mouseover. Poster #11 used post #5. But how about... Andrew: no mouseover. The content of the post. Andrew has removed the quote from post #4. A quote in a post. The dotted line is adaptable in BSS. The post is also harvested. 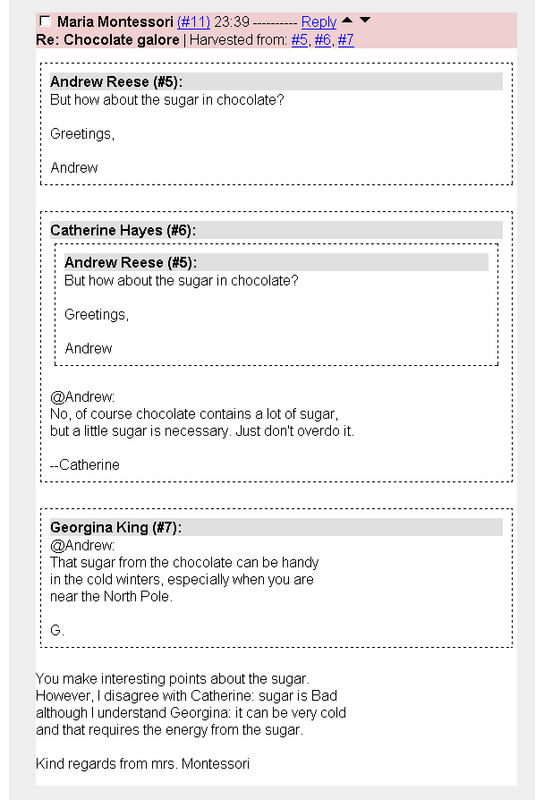 Georgina replies on #5, but does not quote and says something to Andrew. This post is needed for post #11, because that post contais many quotes and harvests. Andrew is in fact a registered user, but even a registered user cannot create a clickable link to some stray URL outside of the website. Any poster (visitor or registered user) is allowed to refer to a file on the web server where the Althing (weblog) is hosted. The registered users have the advantage of the File Manager, the anonymous visitors have to 'know' the exact name of the file or image. (They can see those filenames when quoting a post that has a link in it). Noone is allowed to post a clickable link to a resource outside the website. This is a security feature. Note that it is perfectly OK to simply write the URL as text, as demonstrated in this post #9. This post (submitted by an anonymous visitor calling himself 'Ludovico') was made visible immediately because the 'Initial visibility' (see 3.2.1 Status and visibility) was 'Visible'. After reading this post by 'Ludovico', a moderator (in this case Maria Montessori, see 3.4 View log) decided that this post #10 was inappropriate. She changed two things. Firstly she made post #10 'Hidden' using the Moderation option of the Althing (see 3.3 Moderate). Secondly, she changed the 'Initial visibility' of the Althing from 'Visible' to 'Registered users' (see 3.2.1 Status and visibility). This blocks the immediate publication of posts by anonymous visitors like 'Ludovico', while at the same time allowing posts from registered users made visible immediately. From this point onwards new posts by anonymous users (like #12, also by 'Ludovico', see 2.6.7 Unpublished (post #12) below) remain unpublished until a moderator approves and decides to publish it. A nice illustration of the harvesting feature. Three posts from which one is a quote in a quote. Also note the: Harvested from: #5, #6, #7. There is no visible post #12, not even redacted. The post is submitted but remains unpublished as can be seen in Moderate. After having received this post, Maria Montessori has set the Initial visibility from Open to Registered users to prevent further actions from Ludovico. See also 2.6.5 Redacted for the explanation. 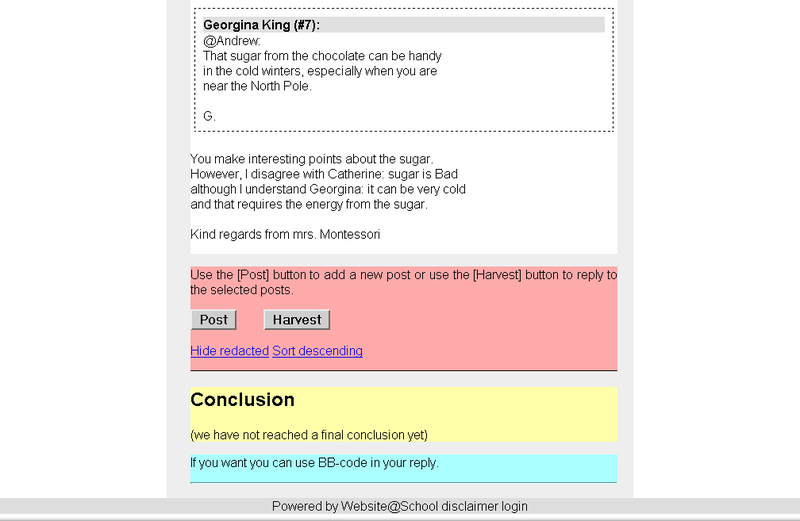 [Post] and [Harvest] buttons also at the bottom of the overview of posts. Clickable link shows Hide redacted or Show redacted makes all redacted posts invisible and changes the link name or vice versa. This is a useful feature when many posts are redacted. In the next section a brief summary is given of the content of Content, wereafter Configure, Moderate, View log and Report are discussed. Description: In the Menu the usual Basic properties and Advanced. The Content is divided in Configure, Moderate View log and Report. 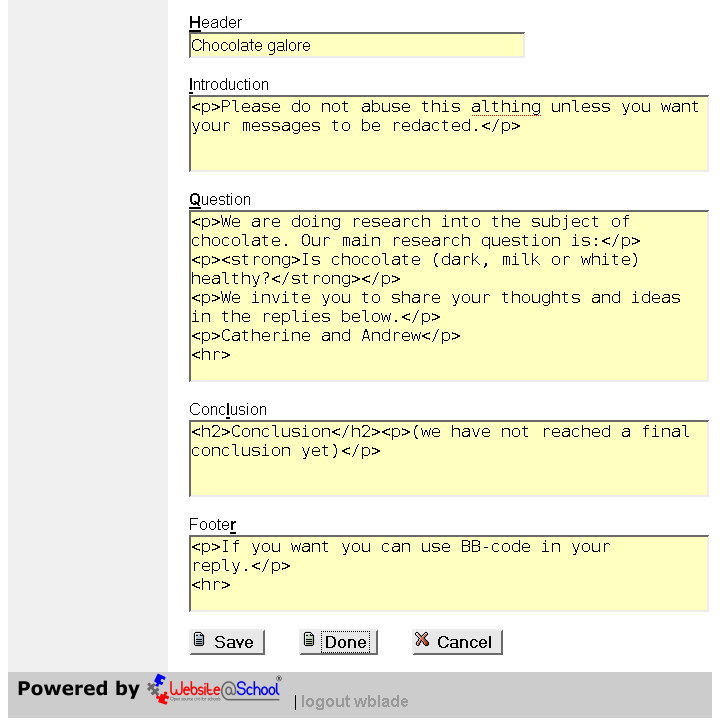 The Althing-module is a research tool to publish a question, supposition, etc. Visitors can react, their posts can be analysed, a report can be constructed and results published. The following options are available in the submenu. Configure - For this Althing, several text fields can be configured. E-mail alert lists for moderators and subscribers can be created . The visibility of posts and the status of the Althing can be set to Open, Frozen or Closed. Moderate - The overview screen gives a summary list of all posts. From there you can navigate to individual posts. Approve new posts or make posts invisible. Posts can can be awarded with Marbles. Please see the comprehensive explanation in the manual. 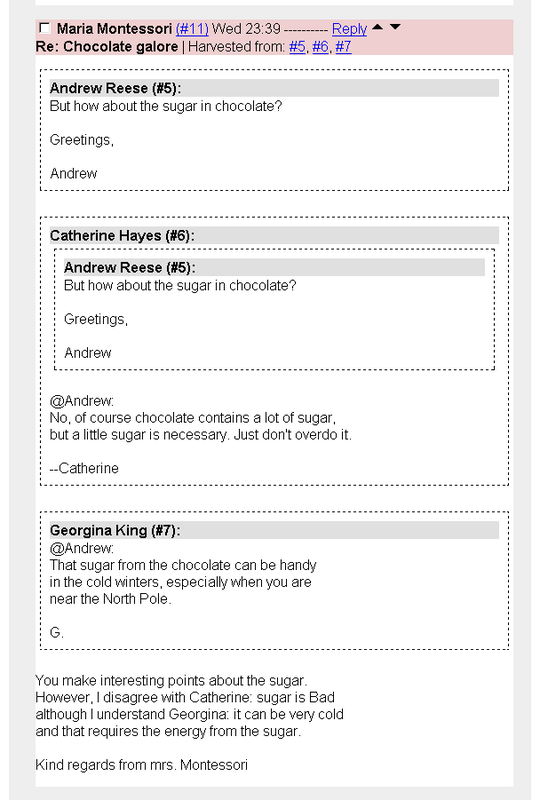 View log - An overview of all moderator remarks, ordered by post. Report - Select posts in a self-defined sort order and create output for further processing. Please select one of the options to continue. Configure: Clicable link to the Configuration page. Moderate: Clickable link to the Moderation page. View log: Clickable link to the Log viewer. Report: Clicable link to the Report generator. NOTE: to save some space, entry fields in screenshots are shortened. The default configuration settings are: 'Opened' and 'Hidden'. This ia a security feature. Opened: Posts are visible and new posts can be added, replies given and harvests made. Frozen: No more posts can be added. The [Post] and [Harvest] buttons, harvest checkboxes and Reply links are removed from posts. 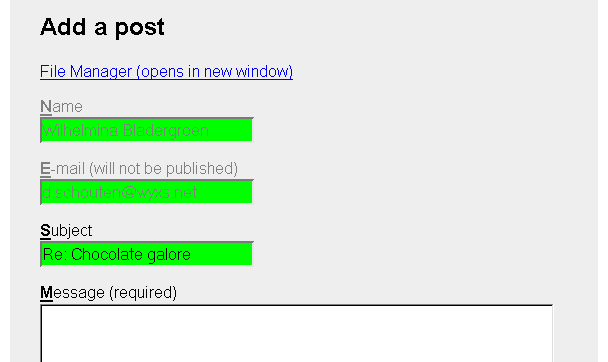 Closed: All posts are invisible, only (if configured) the header-, introduction-, question-, conclusion- and footer texts are visible. Hidden: New posts (also from registered users) are hidden and stay unpublished until a moderator approves them. Only when the post is published, it can be set to 'hidden' or 'visible'. If 'hidden', on the site the post is visible as 'redacted', i.e. subject, poster and content are not visible. NOTE: The default setting for a newly created althing is 'Hidden'. This is a security feature. Registered users: New posts by registered users are approved and published immediately. Post from unregistered users (visitors) must first be moderated for approval. Visible: New posts are always published and immediately visible. A published post can be set to 'hidden' in the moderation page of that post. On the site the post stays visible but 'redacted', i.e. subject, poster and content are not visible. Whenever someone post a message, either in a public or in a private area, an e-mail alert is sent to the moderator(s). E-mail alerts are also sent to subscribers, either immediately (open/visible) or after moderation. Below the e-mails are explained. E-mail alerts do not contain a subject and content. This is a security feature. NOTE: to save some space the entry fields in the screenshots are shortened. Below the e-mail alert from visitor wrmorris (Post #1). Below is the e-mail alert from Ludovico's post #12 where he complains about the fact that his post #10 has been made 'Hidden'. At that time, the 'Initial visibility' was 'Open'. Once Maria Montessori discovered the inappropriate post #10, she decided to make it 'Hidden' and she also decided to change the 'Initial visibiliy' to 'Registered users'. This means that Ludovico's latest post #12 was not published (and probably never will be). Subject:    WHY HAVE YOU DELETED MY POST? Below an example of an e-mail alert to the moderators of a private Alting. Below are two posts to subscribers. The first one from a public area, the second from a private area. NOTE: to save space, the entry fields are shown abbreviated. <p>Please do not abuse this Althing unless you want your messages to be redacted.</p>. Question : HTML markup and BSS can be used. Footer: HTML markup and BSS can be used. Moderation is the process of evaluating the posts. In our demonstration data Catherine Hayes and Andrew Reese are the moderators.They are the content masters of the 'Chocolate galore' page. Maria Montessori, their teacher, also has access permissions to that page and keeps any on the work of the moderators. Description: In the Menu the Moderate link is chosen. 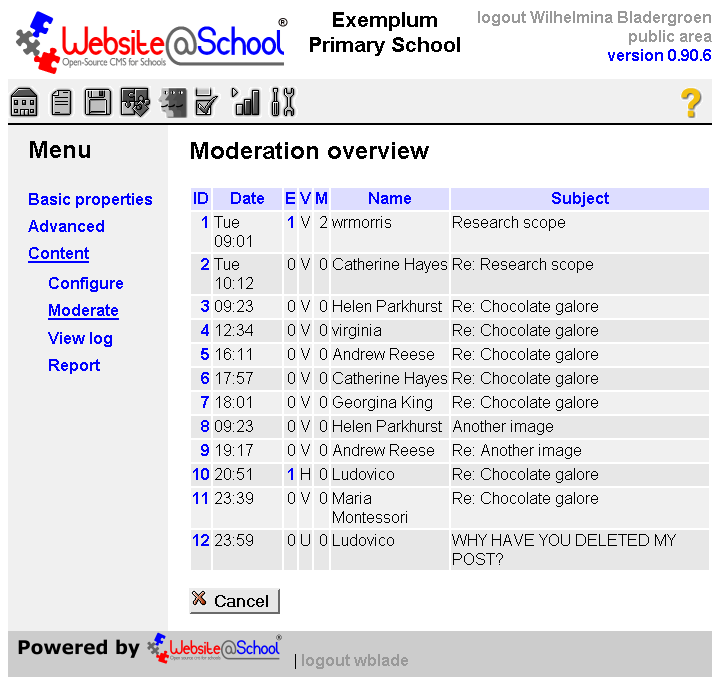 The Moderation overview is a table with 7 columns. The clickable column headers are used to sort the table on that field. A second click reverses the sort order. Unique number of this post in this Althing. Clicking on the post number opens the Post nn - Name - yyyy-mm-dd hh:mm:ss date/time dialogue, where this post can be managed. Date: Mouseover: Date of posting. E: Mouseover: Number of edits (moderations). Clicking on the numbers in the E column, opens the View log of moderation message dialogue. NOTE: Only the numbers > 0 are clickable. H: Hidden. The post is hidden, a 'redacted' message is shown. U: Unpublished. The post is not visible, not hidden but not (yet? )published. The number of marbles for this post. The numbers are not clickable. Please click the Post ID to enter the Post nn - Name - yyyy-mm-dd hh:mm:ss dialogue. Subject: Mouseover: Subject of the post. Description: In the Menu the Moderate link is chosen. This is the place where posts are published, made visible or invisible. All those changes get a remark. If the remarks are done in some clever way, the overview of remarks (in View log) can be a valuable instrument when using the report function. Whenever a change is made in marbles, and or visibility and status, a remark must be added. This is a feature. Previous post-Up-Next post: Clickable links for navigating between the Moderation overview list and its posts. Try it and enjoy this feature when having to moderate a number of posts! ID: n(n): The post ID and the number of the post in the database. The numbers can differ if more Althings are added. IP-address: nnn.nnn.nnn.nnn: The IP-address of the poster. This address is not displayed. <name@example.net>: The email address of the poster. This address is not displayed in the overview of posts. Date: yyy-mm-dd hh:mm:ss: Here the date is always displayed in full, whereas the visitors see the abbreviated date, e.g. hh:mm or dd hh:mm. From: name: The authors name. Subject: subject : The subject of the post. Content of post: speaks for itself. 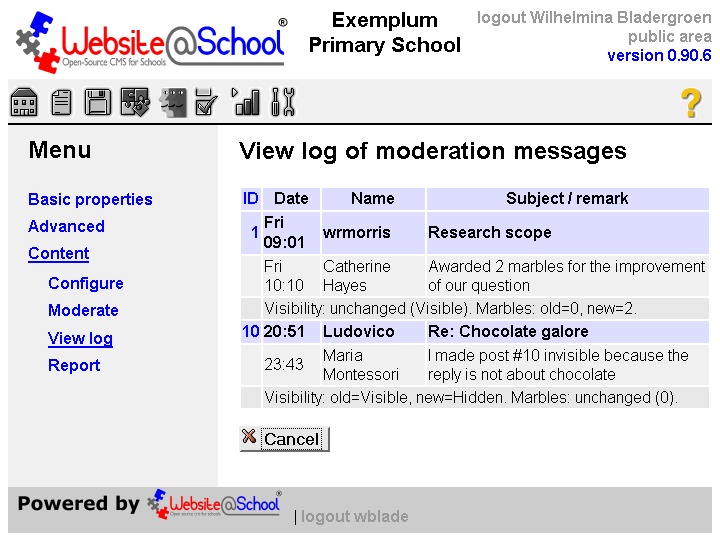 Moderations: n: Clickable link to the View log of moderation messages dialogue. Note that this link is not clickable if there are no moderations for this post at all. Marbles [entry field]: Enter a number between 0 and 10 to validate this post. In the post asterisks from none '----------' to, for example, 5: '*****-----' show how the post is valued by the moderators. Visibility: (radio button) Visible (radio button) Hidden | Status: (radio button )Published (radio button )Unpublished: Please see the table below for details on these settings. Remark [entry field]: To enter a remark about the change(s) the moderator made. When a change is made, a remark must be given. [Cancel] = discard the changes and return to Moderation overview. Previous post-Up-Next post: Clickable links for navigating between the Moderation overview list and its posts. Try it and enjoy this feature! NOTE: These clickable navigation links 'remember' the sort order you selected earlier in the Moderation overview. Example: you could sort the list by author name and quickly step through all posts by a single author with 'Next post' and 'Previous post'. The complex relations between Visibility (visible/hidden) and status (published/unpublished) is explained in the table below. The Initial visibility is set in Configure. visible = posts are immediately published and can be set to hidden. If the post is hidden, it is shown as 'redacted'. moderated = posts are unpublished and can be published, wereafter they become visible. Once published, they cannot be made unpublished (but can be made hidden). This is a feature. NOTE: If marbles, visibility or status change, you have to add a remark. Please see section 4. The module in practice: tips, 4.6 Marbles for more on this feature. 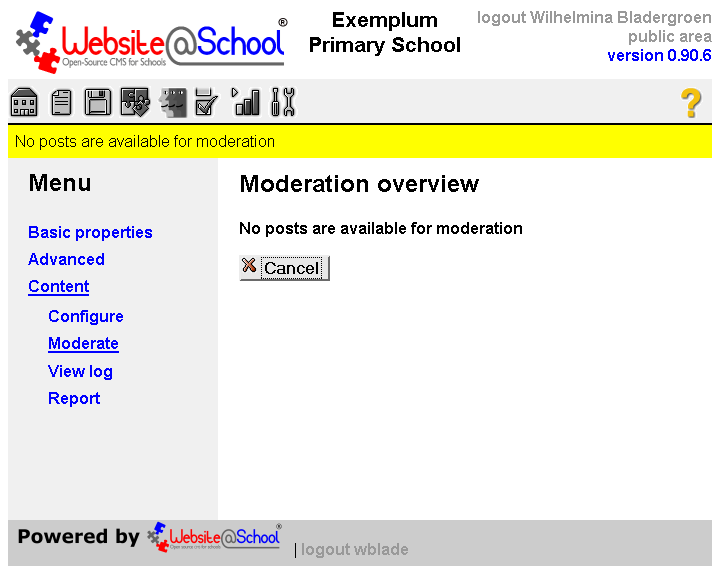 View log shows an overview of all moderation actions. Description: In the Menu the View log is chosen. ID: Clickable link to reverse the sort order. n: The ID numbers are clickable links to the Post nn - Name - yyyy-mm-dd hh:mm:ss dialogue. Bold name: Name of author. The mouseover shows the e-mail address. Subject remark: The subject of the post and the moderator's remark. Visibility: old=...., new=... Marbles: old=...New=...: The track record of the post. Every change made to visibility or marbles is recorded; a moderator is not able to keep a moderation secret for the other moderators. This is a feature. Cancel: to return to the Moderation overview. Please see section 4. The module in practice: tips, 4.8 Logging for usage of this feature. Description: In the Menu the Report is chosen. In the workplace severeral checkboxes to select report output. Posts [entry field]: Enter a comma delimited list of posts. Example: 3,4. Keyboard shortcut: Alt-P or Cmnd-p. NOTE: You should use the Display-ID number '#n' (omit quotes and #) and not the Post-ID '(n)' in this list. Fields: the fields that can be selected to be included in the report. [checkbox] Message ID: Keyboard shortcut: Alt-M or Cmnd-M.
[checkbox] Author: Keyboard shortcut: Alt-A or Cmnd-A. [checkbox] Subject: Keyboard shortcut: Alt-S or Cmnd-S.
[checkbox] Date: Keyboard shortcut: Alt-D or Cmnd-D.
[checkbox] Reply: Keyboard shortcut: Alt-R or Cmnd-R. Format: The form of the output. [checkbox] HTML (page): Keyboard shortcut: Alt-H or Cmnd-H.
[checkbox] HTML (code): Keyboard shortcut: Alt-T or Cmnd-T.
[checkbox] BBCode Keyboard shortcut: Alt-B or Cmnd-B. Description: The generated output as web page. The advanced options also apply to this module. In particular it means that you can use Bazaar Style Style (BSS) to get rid of awfful colors that mismatch with the school site or with the pictures on the page. More on the backgrounds of BSS can be found in chapter Viewpoints, paragraph 4. On form and content. The moderators of one Althing must have Admin permissions, set in: Account Manger > Users > Username > Admin: Basic administrator, Page Manager, File Manager. In the Page Manager the modeators are given permission as Content master (i.e. only read and write of content) for their Althing. If the teacher has at least Page Master permissions, she can , for example, set the Althing page to invisible, hidden, embargo or read only. 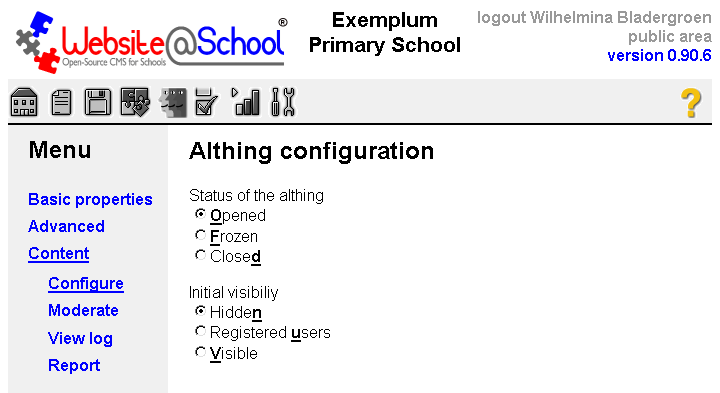 At the Exemplum Primary School the permissions are set as follows. Andrew and Caterhine are members of the group Seniors in the capacity of Pupils. By way of the group permissions of the Seniors they already have access to the Page Manager and the File Manager for their own pages. For this Althig only they are given permissions as Content master (lowest permissions, only read and write). Now it's possible to long as Andrew or Caterhine manage the complete Althing, but they cannot touch anything else. The teacher of the Seniors (Maria Montessori) has via Seniors/Teacher permissions to the Page- and File Manager. And she has been given, for this Alting only (!) permissions as Page Master. She changes properties of the node itself, for example, make it read-only. 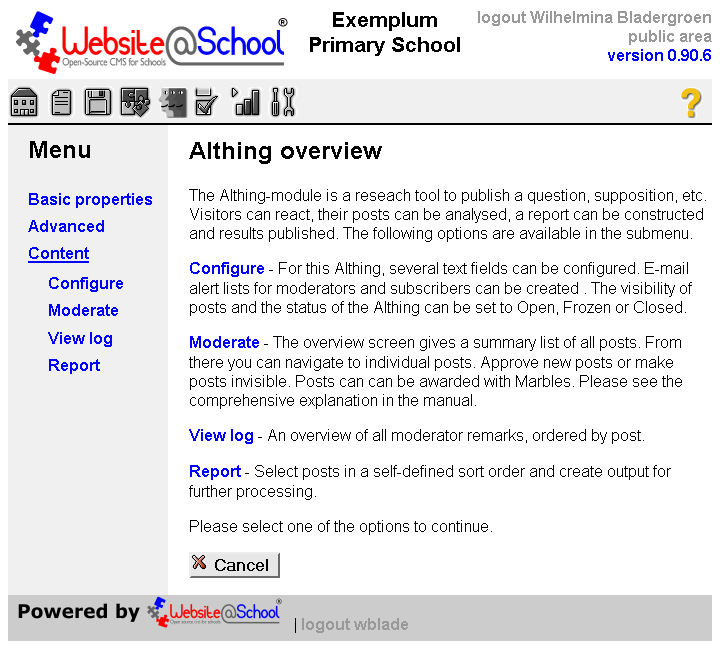 MOTE: When creating an Altihing page, you have to have at least Pagemaster permissions. NOTE: Remember that Wilhelmina Bladergroen is webmaster and Guru; she has access to all things in all Althings. - Althing: Icelandic for parliament. Wikipedia: Althing. Unfortunately Wikipedia's 'web log' redirects to 'blog': "A weblog (a truncation of the expression web log) is a discussion or informational site published on the World Wide Web and consisting of discrete entries ("posts") [...]". Wikipedia: Blog. Downloadble in PDF format on http://dscho.home.xs4all.nl. - Corresponderen per weblog (Corresponding with a weblog), Echer cahier no. 3. Auteurs: de Uilen van het ANker en de bovenbouw van de Toermalijn, juf Titia Schuitemaker en meester hans Bol, John Bronkhorst en Jimke Nicolai. Uitgave van JAS (Jenaplan Advies en Scholing), BLL (Bureau voor Levend Leren) en De Freinetwinkel. Valthe 2008. ISBN/EAN: 978-90-70961--34-3.